Photoshop Elements provides you with a number of preset libraries that you can load and use when editing images. You can load a Brushes library to acquire different brush tips you use with the Brush tool. But you’re likely to want to customize the Elements preset libraries at least a little bit, too. You can change libraries individually in respective panels where the items are used. For example, you can change color swatch libraries on the Color Swatches panel or brush tips libraries from Options bar choices. Another way you can change libraries is to use the Preset Manager dialog box. 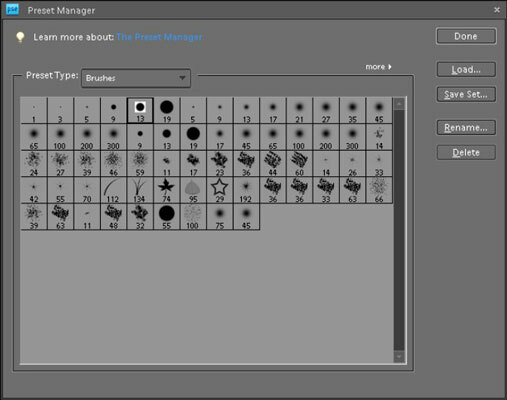 Preset Type: Open the drop-down menu to choose from Brushes, Swatches, Gradients, and Patterns. More: The More drop-down menu lists different viewing options. You can view the library items as text lists or as thumbnail views. Load: Click this button to open another library. Elements provides you with several libraries for each preset type from which to choose. Rename: Each item in a library has a unique name. If you want to rename an item, click the thumbnail in the Preview pane, click Rename, and type a new name in the dialog box that appears.